Colorado Doberman Pinscher Rescue View other Doberman Pinschers for adoption. 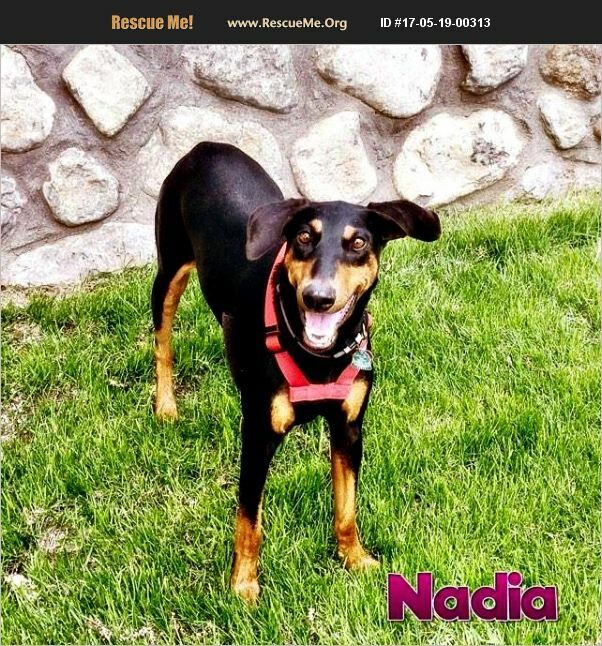 Nadia is a super sweet shy girl ��%BD��%BD��%BDho will need to earn your trust however once she warms up to you she will be quiet smitten with you and loves giving kisses. She is good with dogs and pays no attention to cats. She would be fine with teenagers but due to her shyness we don't recommend younger kids for this girl Nadia is already potty trained and we are working on basic commands and she is picking them up quickly. She does not do well crated however and will do about anything to get out of one. All animals adopted from us are fully vetted including spay/neuter, vaccines, microchip, heartworm test and deworming. Please email us at HookedOnDobies@gmail.com, visit our Facebook page www.facebook.com/savingdobermankind or webpage https://www.savingdobermankind.org to request an application, inquire about an adoption fee, or to learn more! We do require a completed adoption application to be submitted before discussing details of a specific Doberman. We DO NOT have a central location, out foster homes are located throughout our geographic region including CO, WY, NM and TX. We strive to PROTECT the privacy of out fosters. ALL Doberman meet and greets are conducted in a neutral meeting location made by appointment only.